1. Amanita albocreata, in northern hardwood-hemlock (Tsuga canadensis) forest, Sussex Co., New Jersey, U.S.A.
2. Amanita albocreata Atk., in minimal soil over serpentine with environmentally stunted Larix laricina and Betula, near base of Table Mtn., Isl. of Newfoundland, Prov. Newfoundland and Labrador, Canada. intro Amanita albocreata is a species of the hardwood-hemlock (Tsuga) forest of the northeastern U.S.A. and southeastern Canada and of boreal forest at least as far north as the Island of Newfoundland. Its cap is white with a yellowish or yellowish tan center and a strongly striate margin. The volval is distributed over the 25 - 65 (-85) mm wide cap as white warts. The gills are free to slightly adnate, subcrowded to crowded, pale cream in mass, 3 - 10.5 mm broad, with a minutely flocculose edge. 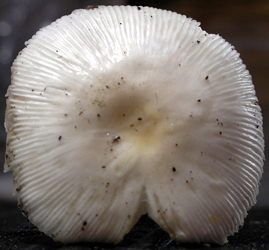 The short gills are truncate to excavate-truncate with or without an attenuate "tooth" at the juncture with the flesh of the cap. The stem is 80 - 120 × 6 - 8 mm and lacks a ring entirely. The notable bulb (15 - 22 × 12 - 20 mm) bears a distinct white collar as do some species with annulate stems such as A. multisquamosa Peck, A. velatipes G. F. Atk., and A. pantherina (DC. : Fr.) Krombh. The spores measure (7.3-) 7.7 - 9.5 (-11.6) × 6.6 - 8.4 (-9.4) μm and are globose to subglobose or occasionally broadly ellipsoid and inamyloid. Clamps are rare at bases of basidia. 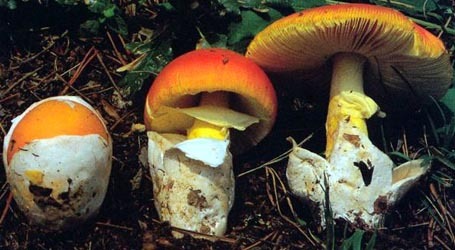 The species may be toxic and would be likely to produce dramatic symptoms similar to those of A. muscaria (L. : Fr.) Lam. and A. pantherina. author (G. F. Atk.) E.-J. Gilbert. 1941. Iconogr. Mycol. (Milan) 27, suppl. (2): 259. ≡Amanitopsis albocreata G. F. Atk. 1902. J. Mycology 8: 111. ≡Vaginata albocreata (G. F. Atk.) Murrill. 1913. Mycologia 5: 84.
lectotypifications Jenkins. 1977. Biblioth. Mycol. : 29.
type studies Jenkins. 1977. Biblioth. Mycol. 57: 81. Jenkins. 1982. Mycotaxon 14: 237.
revisions Jenkins. 1977. Biblioth. Mycol. 57: 29. [suppl.] Tulloss and Jenkins. 1986. Mycotaxon 26: 81, figs. 1-3.
selected illustrations Jenkins. 1986. 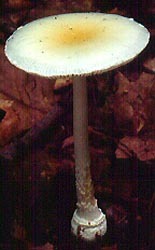 Amanita N. Amer. : figs. 67-68. The same field may also contain black text, which is data from a revision of the species (including non-type material and/or material not cited in the protolog). Paragraphs of black text will be labeled if further subdivision of this text is appropriate. pileus 26 - 62 (-85) mm wide, broadly campanulate then planoconvex with decurved margin, eventually depressed over disc and with upward flaring margin, white (sometimes cream in senescence) with yellow to Maize Yellow (2.5Y 8.5/6.0) to yellow-tan disc, unchanging when cut or bruised, viscid when wet to tacky to waxy when dryer, shiny to subshiny; context white with infusion of yellow to Maize Yellow under pileipellis (especially strong in disc), unchanging when cut or bruised, 2± - 6 mm thick at stipe, narrowing evenly for one half to three-quarters of radius, then membranous to margin; margin striate to tuberculate-striate [(0.35R-) 0.45 - 0.5R], nonappendiculate; pileipellis becoming 1± mm thick in disc, sordid, waterlogged, yellowish, gelatinizing; universal veil absent or as white crumb-like warts or scant patches, detersile, friable, unchanging when damaged. lamellae free to narrowly adnate, with or without small decurrent tooth (10× lens) but lacking decurrent line on stipe apex, subcrowded to crowded, pale cream in mass, white in side view, 3 - 10.5 mm broad, without decurrent lines on stipe, not staining or bruising, with edge minutely flocculose; lamellulae truncate to subtruncate to excavate-truncate, with or without attenuate tooth upon meeting pileus context, of diverse lengths, plentiful, unevenly distributed. stipe 71 - 119 × 6 - 8 mm, white to off-white, sometimes browning slightly from handling, narrowing upward slightly or cylindric, occasionally narrowest at midpoint, flaring at apex, smooth at apex, finely pruinose slightly lower, finely fibrillose in lower third, faintly longitudinally striatulate, with fibrils becoming raised slightly in age; context white (to off-white in age), sometimes with water-soaked streaks, sometimes with faint tint of brown in bulb or in wounds to stipipellis, stuffed (with firm white tissue comprising longitudinally oriented cottony fibrils) or hollow, possibly becoming hollow from the top down, having central cylinder 1 - 2 mm wide, with larvae tunnels pale orangish brown to brown; bulb stark white, 15 - 22 × 12.5 - 20 mm, napiform to subnapiform to subglobose to ovoid, occasionally flattened longitudinally, occasionally splitting longitudinally, sometimes with white pseudorhizae on bottom; exannulate; universal veil as complete (although occasionally somewhat irregular) white to off-white collar about 1 mm or less high, near top of bulb, occasionally with white shreds of submembranous limbus internus within collar and leaning on (or appressed to) stipe. odor/taste Odor fungoid and pleasant. Taste not recorded. tests MACROCHEMICAL TESTS: L-tyrosinase spot test for tyrosinase - postive in all parts of the basidiocme; reaction particularly rapid and intense in pileus and on pileipellis. 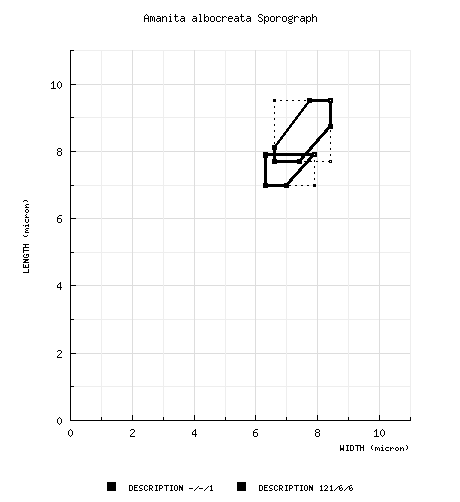 Syringaldazine spot test for laccase - negative throughout basidiome. Test vouchers: Tulloss 7-7-85-A, 8-2-97-A. pileipellis double click in markup mode to edit. universal veil On pileus: ??. At stipe base: filamentous undifferentiated hyphae 1.1 - 5.0 μm wide, plentiful to dominant, branching, singly and in fascicles, sometimes anastomosing, occasionally with subrefractive yellow walls (then up to 15.0 μm wide and branching); inflated cells common to plentiful, probably less so than on pileus, occasionally clustered, thin-walled, colorless, hyaline, terminal singly, ellipsoid to clavate to cylindric to fusiform (e.g., 29 - 37 × 10 - 23 μm); vascular hyphae not observed. from type study of Jenkins (1982): [-/-/1] 7.0 - 7.9 × 6.3 - 7.9 μm, (Q = 1.0 - 1.25; Q' = 1.08), hyaline, thin-walled inamyloid, globose to subglobose to broadly ellipsoid, adaxially flattened; apiculus sublateral, cylindric to truncate-conic; contents guttulate; color in deposit not recorded. composite of data from all material revised by RET: [121/6/6] (7.3-) 7.7 - 9.5 (-11.6) × 6.6 - 8.4 (-9.4) µm, (L = 8.1 - 9.0 µm; L’ = 8.7 µm; W = 7.1 - 8.1 µm; W’ = 7.6 µm; Q = (1.0-) 1.04 - 1.23 (-1.32); Q = 1.10 - 1.16; Q’ = 1.14), hyaline, colorless, smooth, thin-walled, inamyloid, globose to subglobose to broadly ellipsoid; apiculus sublateral; contents guttulate; white in deposit. ecology Commonly solitary, sometimes scattered in small numbers. Isl. of Newfoundland: In soil on sparsely vegetated serpentine rock, with dwarf Betula and Larix. New Jersey: In loam in northern hardwood-hemlock forest near Tsuga canadensis, Quercus rubra, Acer sp., Betula lutea, et al. North Carolina: [GSMNP Indian Gap] Under T. canadensis. Pennsylvania: Under T. canadensis. material examined from type study of Jenkins (1982): U.S.A.: NEW YORK—Tompkins Co. - Ithaca, Beebe Lk. woods, 12.vii.1902 H. H. Whetzel 9822 (lectotype, CUP). CANADA: NEWFOUNDLAND & LABRADOR—Isl. of Newfoundland - GMNP, lower Green Garden Tr., 29.viii.2003 Andrus Voitk s.n. (RET 329-10, nrITS seq'd. ); GMNP, ca. Waterhouse Brk., The Tablelands, Table Mtn., 2.ix.2005 Noah Siegel s.n. [Tulloss 9-2-05-B] (RET 388-1); Serpentine SIMMS, 8.ix.2007 A. Voitk s.n. (RET 417-4, nrITS seq'd.). ONTARIO—Norfolk Co. - Port Dover [42.7863° N/ 80.198° W, 182 m] 29.vi.2013 Eva Skific s.n. [mushroomobserver #137988] (RET 547-7, nrITS seq'd.). U.S.A.: MAINE—Penobscot Co. - Old Town, 12.viii.1983 J. Hurley s.n. [Tulloss 8-12-83-D] (RET 105-6), NEMF1983 participant s.n. [Tulloss 8-12-83-F] (in herb. David T. Jenkins, Univ. Alabama, Birmingham); Pushaw Lk. SW of Pushaw, 12.viii.1991 "M. M. J." s.n. [Tulloss 8-12-91-E] (RET 031-5, nrITS seq'd.). Unkn. Co. - unkn. loc., "Mimi's," viii.1984 S. S. Ristich s.n. [Tulloss 8-84-SSRA-1] (RET 207-3). MASSACHUSETTS—Unkn. Co. - unkn. loc., NEMF1986, Trip #17, 16.viii.1986 H. Stoleson s.n. [Tulloss 8-16-86-B] (RET 137-8). NEW JERSEY—Sussex Co. - Stokes St. For., 7.vii.1985 M. A. King, D. C. & R. E. Tulloss 7-7-85-A (RET 054-8, nrITS seq'd.). PENNSYLVANIA—Luzerne Co. - Ricketts Glen St. Pk., 12.vii.2014 David Wasilewski s.n. [mushroomobserver #169760] (RET 634-8, nrITS seq'd.). Northampton Co. - ca. Belfast, Jacobsburg St. Pk. [40.7882° N/ 75.3044° W, 150 m], 2.viii.1997 NEMF1997 participant s.n. [Tulloss 8-2-97-A] (RET 263-4, nrITS seq'd. ), Rhoda Roper s.n. [Tulloss 8-2-97-D] (RET 263-5). TENNESSEE— Swain Co. - GSMNP, Indian Gap, 19.vii.1961 L. R. Hesler 24419 (TENN). photo RET - (1) Stokes State Forest, Sussex Co., New Jersey, U.S.A.; (2) near base of Table Mountain, Island of Newfoundland, Province of Newfoundland and Labrador, Canada. provisionally identified as: Amanita albocreata G. F. Atk. select a collection to review/add spore measurements..#775571. H. H. Whetzel, #9822, U.S.A., NEW YORK, Tompkins Co., Ithaca, Beebe Lak..#775572. Noah Siegel, #s.n.=>Tulloss 9-2-05-B, CANADA, NEWFOUNDLAND & LABRADOR, ..#775573. J. Hurley, #s.n.=>Tulloss 8-12-83-D, U.S.A., MAINE, Penobscot Co., Old ..#775574. NEMF1983 participant, #s.n.=>Tulloss 8-12-83-F, U.S.A., MAINE, Penobsco..#775575. "M. M. J. ", #s.n.=>Tulloss 8-12-91-E, U.S.A., MAINE, Penobscot Co., Pus..#775576. S. S. Ristich, #s.n.=>Tulloss 8-84-SSRA-1, U.S.A., MAINE, Unkn. Co., un..#775578. H. Stoleson, #s.n.=>Tulloss 8-16-86-B, U.S.A., MASSACHUSETTS, Unkn. Co...#775579. R. Peabody & R. Phillips, #s.n.=>Phillips 3313, U.S.A., NEW JERSEY, Mor..#775580. M. A. King, D. C. & R. E. Tulloss, #7-7-85-A, U.S.A., NEW JERSEY, Susse..#775581. NEMF1997 participant, #s.n.=>Tulloss 8-2-97-A, U.S.A., PENNSYLVANIA, No..#775582. Rhoda Roper, #s.n.=>Tulloss 8-2-97-D, U.S.A., PENNSYLVANIA, Northampton..#775583. L. R. Hesler, #24419, U.S.A., TENNESSEE, Swain Co., Great Smoky Mountai..#775664. ENDFONT OLIVEFONT, #s.n., U.S.A., MAINE, #775682. R. Peabody & R. Phillips, #s.n.=>Phillips 3313, U.S.A., NEW JERSEY, Mo..#775700. NEMF1997 participant, #s.n.=>Tulloss 8-2-97-A, U.S.A., PENNSYLVANIA, N..#775701. Rhoda Roper, #s.n.=>Tulloss 8-2-97-D, U.S.A., PENNSYLVANIA, Northampto..#778220. "M. M. J." s.n. , #s.n.=>Tulloss 8-12-91-E, U.S.A., MAINE, Penobscot C..#781846. Eva Skific, #s.n.=>mushroomobserver # 137988#781854. NEMF1997 participant, #s.n.=>Tulloss 8-2-97-A, U.S.A., PENNSYLVANIA, N..#781855. Rhoda Roper, #s.n.=>Tulloss 8-2-97-D, U.S.A., PENNSYLVANIA, Northampto..#810460. H. H. Whetzel 9822 , #s.n., U.S.A., NEW YORK, Tompkins Co., Ithaca, B..#810461. Andrus Voitk s.n. , #s.n., CANADA, NEWFOUNDLAND & LABRADOR, Isl. of N..#810462. Noah Siegel, #s.n.=>Tulloss 9-2-05-B, CANADA, NEWFOUNDLAND & LABRADOR,..#810463. A. Voitk s.n., #s.n., CANADA, NEWFOUNDLAND & LABRADOR, Isl. of Newfou..#810464. Eva Skific, #s.n.=>mushroomobserver # 137988#810465. J. Hurley, #s.n.=>Tulloss 8-12-83-D, U.S.A., MAINE, Penobscot Co., Old ..#810466. NEMF1983 participant, #s.n.=>Tulloss 8-12-83-F, U.S.A., MAINE, Penobsc..#810467. "M. M. J." s.n. , #s.n.=>Tulloss 8-12-91-E, U.S.A., MAINE, Penobscot C..#810468. S. S. Ristich s.n., #s.n.=>Tulloss 8-84-SSRA-1, U.S.A., MAINE, Unkn. C..#810469. H. Stoleson, #s.n.=>Tulloss 8-16-86-B, U.S.A., MASSACHUSETTS, Unkn. C..#810470. M. A. King, D. C. & R. E. Tulloss 7-7-85-A, #s.n., U.S.A., NEW JERSEY,..#810471. David Wasilewski s.n. , #s.n.=>mushroomobserver # 169760#810472. NEMF1997 participant, #s.n.=>Tulloss 8-2-97-A, U.S.A., PENNSYLVANIA, N..#810473. Rhoda Roper, #s.n.=>Tulloss 8-2-97-D, U.S.A., PENNSYLVANIA, Northampto..#810474. L. R. Hesler, #24419, U.S.A., TENNESSEE, Swain Co., Great Smoky Mountai..